Hello again, everyone! So, after enjoying Victoria Peak on day 1, we decided to go to The Big Buddha (a.k.a. 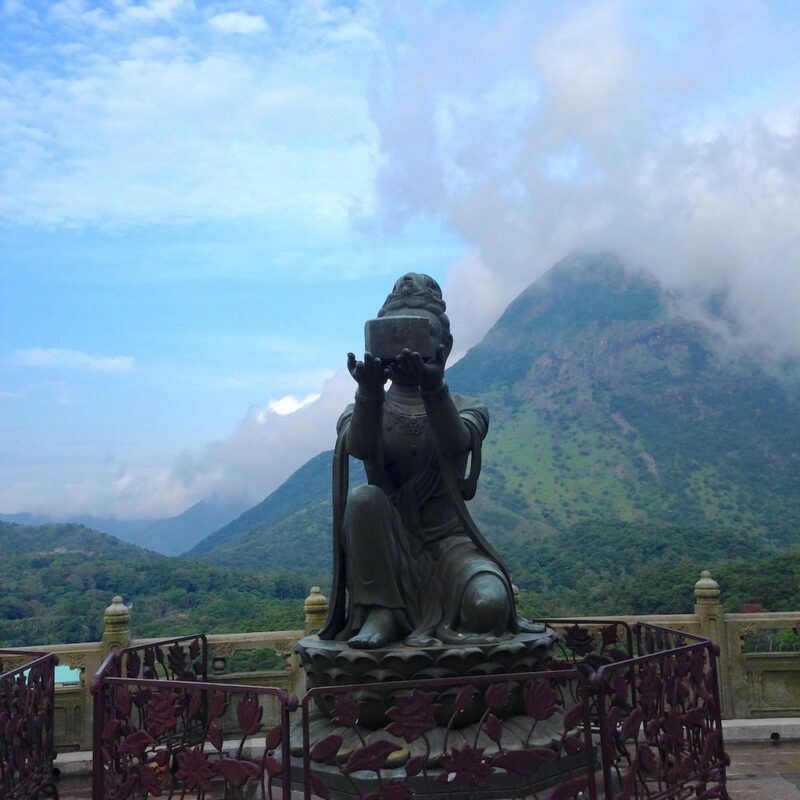 Tian Tan Buddha) in Ngong Ping village. First thing first, after wake up… It’s breakfast. Yea, we didn’t book the room with breakfast, it’s on purpose so we could enjoy more local food (or at least we intend to). Well, staying at Holiday Inn Golden Mile at Tsim Sha Tsui here got it’s benefit when it comes to food. There’s a lot of food just around the block. Not to mention mall, and places alike. You can just go out to the Mody Road, or Nathan Road, there’s a bunch of places where you can buy food, most of them open from early morning serving breakfast. 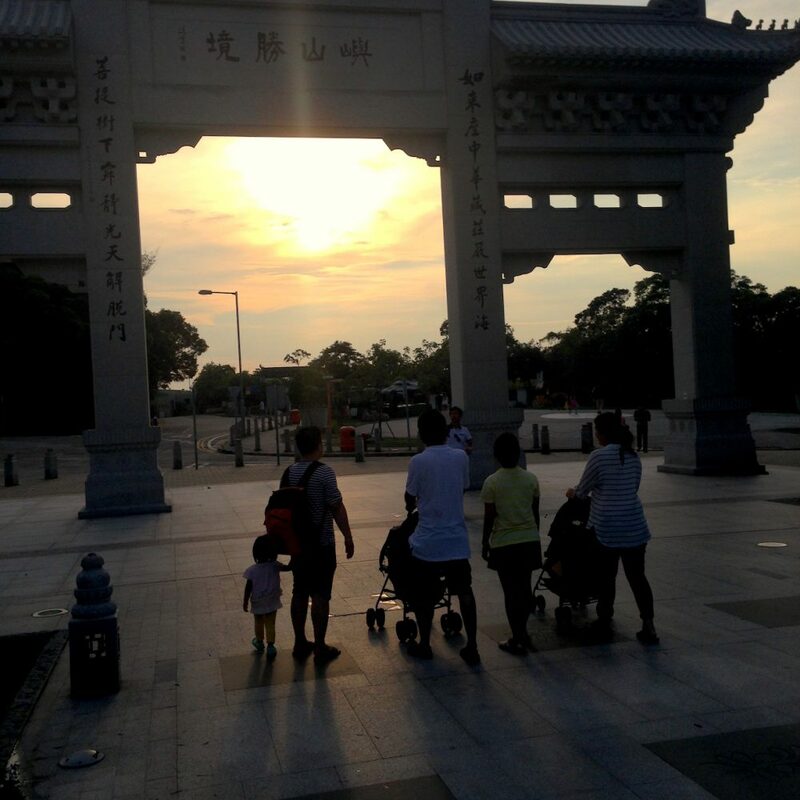 This time, we really chilled out and take our time to be a lazy tourist. Haha! We go out from the hotel at 12. Well… Let’s say we really don’t want to make a fuss of today. Anyway, here’s the map I created for today’s itinerary. So we head out to go to Ngong Ping 360, that’s the attraction name. It is located at Lantau Island, pretty far, so of course, the best transport is MTR. If you’re from the red line, then you’re gonna have to change to the orange line and head to Tung Chung. Not familiar with the MTR system? It’s in my previous post. But again, you can download the pdf here. It took us about 30 minutes to get to Tung Chung. After you arrived at the Tung Chung MTR, you’ll definitely pass through the Citygate Outlets mall. We skipped the mall, and go directly to the Ngong Ping 360 ticket counter, just walk straight passing the mall. And you’ll see the sign. 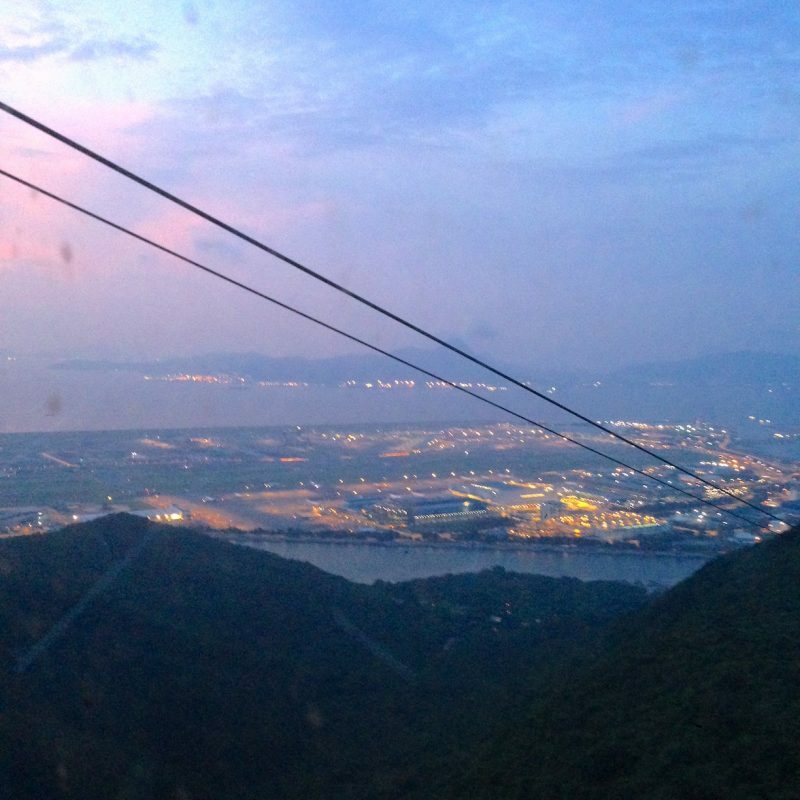 There’re a couple of choices for the deal you can buy at Ngong Ping 360. 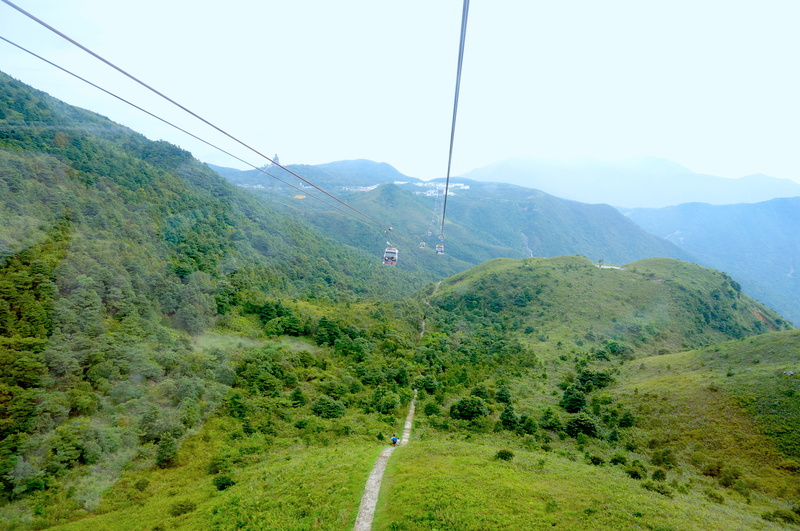 As for me, I go with the Crystal Cabin Cable Car Roundtrip only costs me 210 HKD. But there’s a slight difference in their pricing now for 255 HKD. 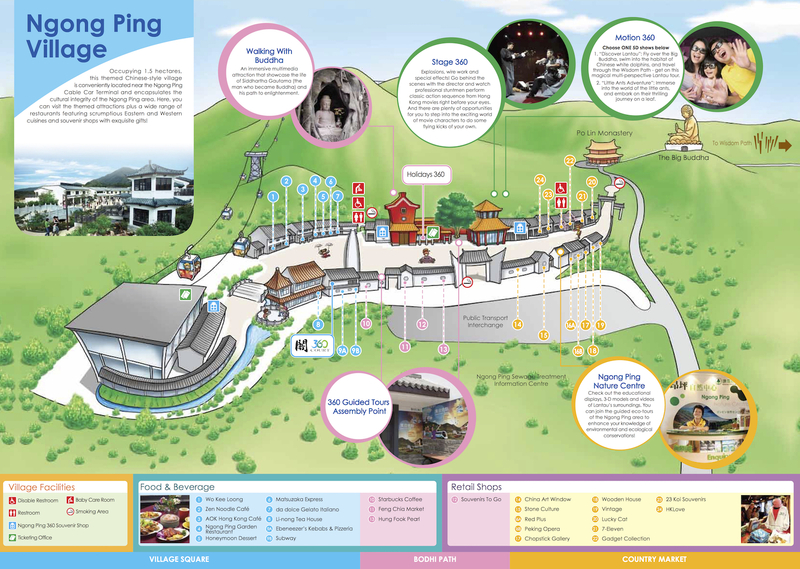 Ngong Ping Village e-brochure. You can download the pdf here. Phobia of Height? Think Twice.. Or Not..
Now I must say, I think it will be lovely and fun to ride on a crystal floor cable car. But apparently, it’s quite terrifying, for the first 5 minutes. For you who has Acrophobia, afraid of heights, maybe going with a crystal floor isn’t really a wise choice. As one of my friends did, he’s ‘forced to’ go with the crystal floor with us, since all of us wanted it. Literally, he cannot even look down, as the cable car going higher and higher. View from Cable Car Cabin with a walking path below. And yes, it was terrifying to look at how we got lifted so high even higher at some point, and only rely on two single pieces of cable. Chill, it’s perfectly safe. At least I think it is. Hey, they claim to be one of 10 world’s amazing cable car experience. A fancy title, right? But, seriously guys, this is one of a kind experience that you don’t want to miss. Here’re some photos. It will take you about 20 minutes something to reach the upper station. So you will have a lot of time to enjoy the view. Sorry for some images got speckles, it’s the glass from the cabin, not my lens. It’s definitely a recommended ride, you should try the crystal floor. When we reach the upper station, again with the crazy queue waiting for the cable car to go down. Oh hey….! There you are guys, y’all up here, no wonder it’s quite an empty line down there… Haha! Trying to ignore that, I was really amazed by the view of such a beautiful and peaceful village. It really was, I wonder maybe that’s what they sell here, peace. You’re gonna enjoy the village as much as I do when it comes to such a surrounding. First, the buildings look authentic kinda cool although it’s like new. Second, the air was so cool, love the breeze and fresh air. Sometimes it can get so cold, so better prepare a jacket or sweater. It happened to be a chilled weather when we arrived there, lucky us. That weather makes the place even more peaceful. They even have Starbucks here. 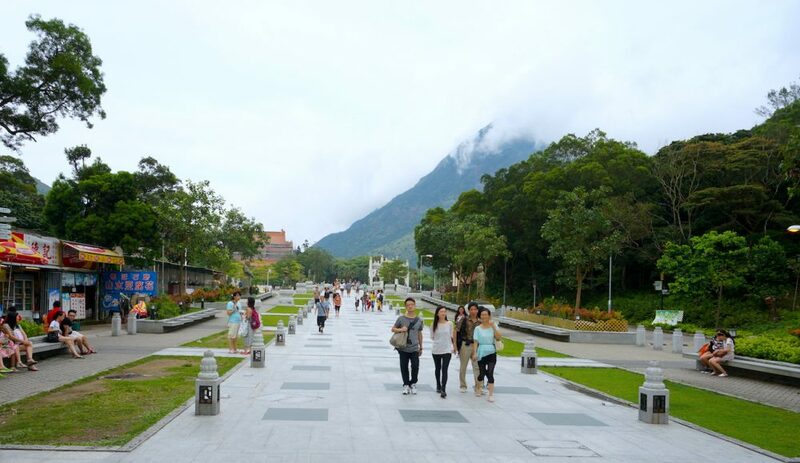 This village culturally themed designed on 1.5-hectare site on Lantau island, serve such a good experience. From eateries to shopping, lovely. Check out for The Walking Buddha, you might get interested in the multimedia presentation for 40HKD and 20 minutes of your time. Walking to the Tian Tan Buddha is not that close, it’s quite a walk, though. But due to the peaceful atmosphere, you won’t feel tired. Not to mention the view is amazing with all the cultural theme and the nature blend in together creating such a stunning visual. Ngong Ping village view. Less crowd is better. We passed a little bazaar that sells unique kinds of stuff, but it’s 4.30 something and they’re packing up ready to close already. Again, I feel we’re lucky to go quite late in the afternoon, not just it’s cooler but with fewer people too. So we surely can take our time and enjoy the village. Even when we reach the entrance to the stairs up to the Buddha statue. A little bit about The Big Buddha, the statue is named Tian Tan Buddha because it’s base is a model of the Altar of Heaven or Earthly Mount of Tian Tan, the Temple of Heaven in Beijing. There are six smaller bronze statues known as “The Offering of the Six Devas” that symbolized offering flowers, incense, lamp, ointment, fruit, and music to the Buddha. These symbolize the Six Perfections of generosity, morality, patience, zeal, meditation, and wisdom. The Buddha statue is 34 meters (112 ft) tall, weighs over 280 tons, and constructed from 202 pieces of bronze. The Buddha’s right hand is raised, representing the removal of affliction while the left rests open on his lap in a gesture of generosity. He faces north, which is unique among the great Buddha statues, as all others face south. If you see the photos, there’s a lot of stairs… Yep, 268 steps to reach the Buddha. Don’t worry, you can rest every once in a while, they make a pit stop for people to climb the stairs by session. But it’s worth the pain, for real. Once you reach the top There are also three floors beneath the statue: the halls of the Universe, of Benevolent Merit and of Remembrance. One of the most renowned features inside is a relic of Gautama Buddha, consisting of some of his alleged cremated remains. Only visitors who purchase an offering for the Buddha are allowed to see the relic, entering to leave it there. There is a huge carved bell inscribed with images of Buddhas in the showroom. It was designed to ring every seven minutes, 108 times a day, symbolizing the release of 108 kinds of human vexations. Enough for the story, so after 10 or 15 minutes of quite a painful session (with 2 or 3 rest), we made it to the top. It is worth all the pain… It is… Here’s how it looks. Amazing view, is it? We enjoy it for about 1 hour. They close at 17.30, you will be told to go back down and the gates at the stairs will be closed. So yeah, that’s really amazing to see. After going down through the 268 stairs, now I can feel numb to my lower part, it starts to take effect. Lol… Maybe I need more exercise. A little tip, if you’re going here maybe you should consider carrying enough water, it’s pretty expensive to buy drinks here. Well, tourists area, right? Nevermind if you got lots of extra dollar in your pocket. So we head back to the cable car station, and we wait until the last queue (no more queueing I swear, so we just sit and wait), literally the last person to going down, along with some other staffs also queueing to go down. And that caused me to get this sunset view. Sorry for the blurry and dirty photo, it’s taken with iPhone with critical battery, and yeah it’s about 1 %, and shut down right after this shot. The camera was dead too. People might enjoy the Ngong Ping experience overall, but for me, the best part of it was the ride and the feeling when you’re in the village. The atmosphere was lovely. I would definitely pay a visit again in the future. Oh, one more thing, they will take your picture when you enter the cable car, and if you want to purchase it they’ll be ready at the upper station, of course, it is overpriced. 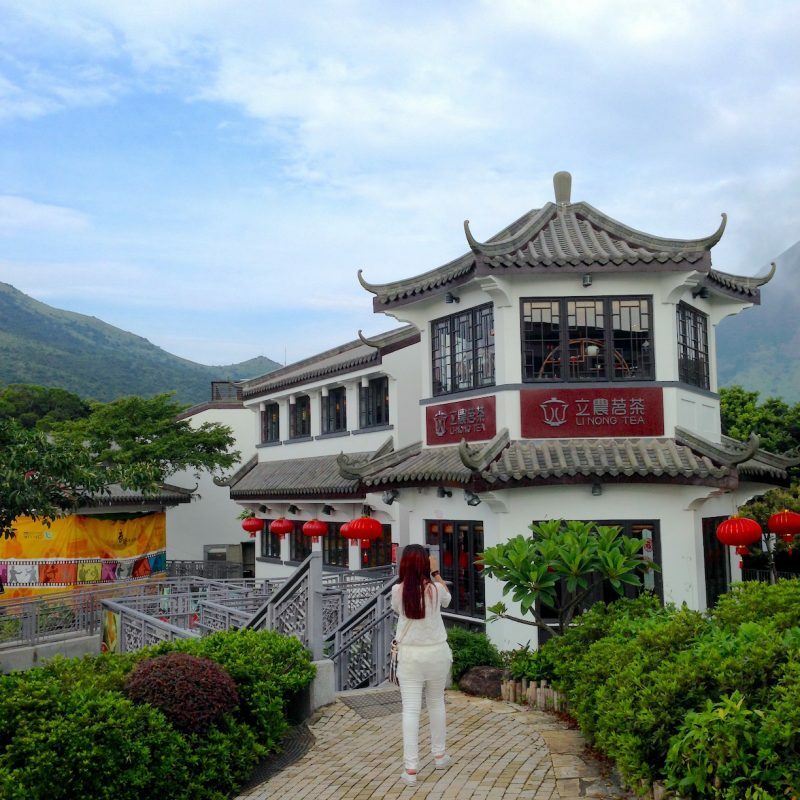 What do you think about this Ngong Ping experience? Have you ever been here too? Would love to hear your thoughts..! Subscribe and share the story, until next post! Here’re some bonus photos that I took with iPhone. Just for intermezzo. Thank you! Hope it’s useful.